This book, and the accompanying exhibitions at the Moravian Gallery in Brno (CZ) and the	Imperial War Museum in London (GB) is the culmination of a five year research effort initiated by James Aulich, a Senior Lecturer in the History of Art and Design at Manchester University. He was soon joined by Marta Sylvestrova, Curator of the poster collection at the Moravian Gallery in Brno, Czech Republic, who's longtime connections with poster designers all over the world proved to be indispensable for the necessary field work which took her to Moscow, St. Petersburg, Kiev, Ljubljana, Zagreb, Bratislava, Cluj, Lodz, Pecs, Rostock, Tallin, Timisoara, Wroclaw, Berlin, Riga, Vilnius, Bucharest, Warsaw, Poznan, Budapest, Minsk and Prague. Although rewarding, it was hard work: The one trip on which I accompanied Marta, to Bucharest in 1994, would alone fill the lifetime adventure budget of most people I know. This work has historic significance, and the authors have my highest admiration for their tenacity to document a part of our cultural heritage that is disappearing fast, for various reasons. 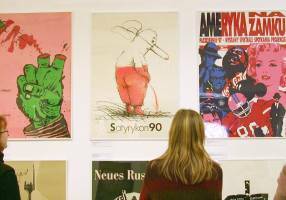 Many of the institutions that kept posters during the Cold War have vanished, or have destroyed their holdings before their commercial value was realized, and many poster designers prefer to forget their political works, together with the hard times and difficult personal situations during which they were made. 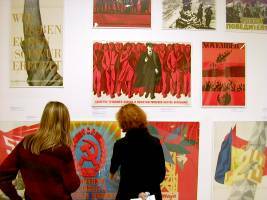 Westerners usually have no idea what it meant to live under a communist regime, and are unfamiliar with its customs, ceremonies, cults, written and unwritten rules, and lies. An explanation or interpretation of most posters and their background is therefore essential, and fortunately, the authors have done just that, on a level of detail that I have not seen in any other publication, with ample and well referenced quotes, supplemented with photographs that capture the spirit of the times. Lenin lived, Lenin lives, Lenin will live ! We will defend the peace!